EIN's Piers Beagley recently interviewed author Kieran Davis about how he manages to produce such excellent books. Kieran Davis is the author of the excellent 'Elvis On Tour- November 1971' book as well as the more recent ‘Elvis: Live At The International’ which featured the diaries of super fan Peggy Elzea. Both books are packed with fascinating text and memorabilia. With so many books and releases surrounding Elvis' in concert, fans often wonder whether there can be anything new to discover or say. However author Kieran Davis has recently managed to publish two fabulous new books both of which take plenty of time to read and are full of new observations and facts about our man. These are not the typical Elvis photo-books you flip through once or twice never to read again. These are absorbing books with plenty to discover - a real treat for Elvis fans who want to know more about his life and performances. It is obvious that Kieran Davis has spent a great deal of time producing these self-published books and EIN wanted to know more. So with the recent release of FTD's Classic Album of 'On Stage' EIN's Piers Beagley checked in with Kieran Davis to find out more about his books. EIN: Kieran, thanks for giving us a chance to ask you a few questions about your fascinating Elvis books. Firstly can I confirm that you are about to do a reprint of you most recent book 'Elvis Live At The International'? Kieran Davis: Yes, 'Live At The International' has been reprinted, but only limited copies, more than half of which are now sold. EIN: That is perfectly timed with FTD’s release last month of the ‘On Stage’ Classic Album, was that planned? KD: That was pure chance. I had been working on 'International' for three years before I released it and had actually sold out before the FTD release was publicised. Renewed interest in my book necessitated the reprint, so the timing couldn't have been better. EIN: When did you first become interested in Elvis and how long have you been a collector? KD: I first heard of Elvis when he died - I was three years old at the time - but had absolutely no interest in him until 1987 during the 'Ten Years After' anniversary. I was just getting into music at that time and all the shows on T.V. captured my attention. I think 'Elvis For Everyone' was the first record I bought during that period and it just went on from there. EIN: Did you collect fan magazines like Elvis Monthly and ones from the US, as your books do feature some wonderful Fan Club articles from the time? KD: As my interest from practically day one was the concert years I would get anything I could from anywhere. 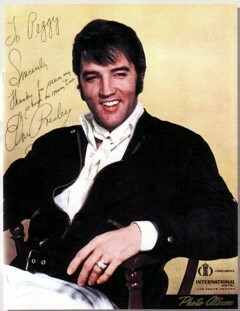 When I was 15 I was buying and selling Elvis memorabilia worldwide - and that was before luxury of the internet. Fan mags, scrapbooks, diaries, letters all came my way, so I amassed a large collection pretty early on. Although, I didn’t appreciate it as much at the time. For example, I would often get magazines and scrapbooks but only keep the bits I wanted as I didn't have enough room for everything, so now I have files of photocopies and clippings that I have no idea from where they originally came - you don't think about these things when you are a teenager. I still use this sort material in my books so fans other fans can see it but I hate the fact that I cannot reference and credit the material properly. This next bit is even worse: I was corresponding with so many people in the late eighties that I was getting information almost daily and it makes me cringe thinking what I threw away. If I got a letter from someone, even people like Charlie Hodge and Al Dvorin I would retype any bits of interest or cut the letter up so their tales could be put in my files and then I’d throw the rest away - signatures, envelopes everything! I now have no original letters from any of these guys, and many others, they are all in a rubbish dump somewhere under 25 years of garbage. Makes you cringe, doesn’t it? EIN: Is there any particular part of Elvis’ legacy that interests you the most? KD : The concert years. Anything from 1969 to 1977 interests me. EIN: What made you finally decide to produce your own books in such a saturated market? KD: It was purely a labour of love and something I wanted to try. I knew I had material in my collection that other fans might like to see and I’ve always been very conscious about preserving history (even if early on I wasn't doing it right!). I realise that in the grand scheme of things an Elvis tour memo is a trivial and largely irrelevant item outside the Elvis world, but when put in context with other material from the same time period it helps paint a better picture of a snapshot in time. I knew I was writing for a tiny niche market where possible book sales would be miniscule, but making money never crossed my mind. I wanted to write books for my own satisfaction and hoped a few other fans might like to read what my research over the past 25 years has uncovered. 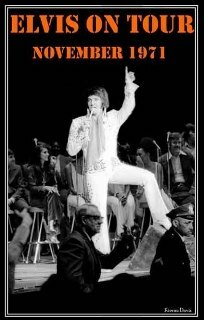 EIN: Although EIN hopes to be across most releases in the Elvis world we actually stumbled upon your first book Elvis November Tour 1971 book by chance seeing it for sale on the internet. Was the November Tour 1971 book the first book you published? KD: Yes, 'November 1971' was my first book. EIN: How long did it take you to write and produce the book? KD: I worked on 'November 1971' and 'International' at the same time for over three years. With both focusing on more or less the same time period in Elvis' career it made sense to research and write both at the same time. EIN: What made you decide on the November Tour 1971 as the theme of your first book? And were you surprised by the sales of your first book? KD: Nothing had been done in it before, at least not in detail. Also, I had some good stories and photographs from the tour so it just seemed like a good place to start. (Right: Elvis in Cleveland Nov 6, 1971). It was an irony that no-one had written a book on the tour in forty years yet Joe Tunzi and I both released our books about the same time. Any time I sell even a single copy of my books it is a pleasant surprise. I never come out ahead (financially) on the books but that has never been the point. Once you factor in the cost of obtaining original photographs, tickets, scarves and all the other memorabilia I feature in my books there is no way to break even, but any money I do get above printing costs helps acquire items and fund research for future books. I do intend to eventually cover every tour and Vegas engagement on one form or another. EIN: From my point of view I need more than just photos of Elvis to justify an expensive book or to keep my fascinated. There are too many Elvis photo books on my shelf that I only flipped through once or twice. So for me, your 1971 November Tour book was a stunner in having so much content to read. How did you discover and source all your material? KD: From the very begining of my collecting I have always been after information and ephemera more than say every L.P. or E.P. Over 25 years my methods have varied as technology has changed, but the quest has always been the same. I will look and buy information/memorabilia from anywhere. For example, in 1988 I wrote to every library, university, newspaper and arena in every city where Elvis had performed asking what information they had. Sometimes I received nothing, other times packets of information. Occasionally, the person processing my request had seen Elvis and they would write a letter containing their own personal memories. I just never knew what would be in the packets as I opened them. It is not like that anymore. Most university and arena records from that long ago have all been destroyed and many newspapers no longer service requests going back that far. I was just lucky to be have written to all those places when I did. EIN: A lot of self-publishers don’t follow through with material copyrights, was this an issue for you with 1971 being a relatively unexplored year? Did you have to track down the photographers for approval? KD: This is always hard and I have not been anywhere near 100% successful. The truth of the matter is a lot of fan taken photographs have been copied so many times no-one remembers where the originals came from. In many instances the original photographer has died or dropped out of the Elvis world a long time ago. At other times more than one person thinks they own the originals. In all these instances I published the photos as 'photographer unknown' but I really would have liked to have credited the original photographers. Most amateur photographs are now untraceable to the original photographer. Obviously it is easier when using professional photographers material as you can get reprint permission from them. Buying original photos from fans or families that attended the shows allows me to acquire the copyrights. It is complicated and the bit I hate the most as you don't want to upset people. Undoubtedly I have made errors and someone knows who some of the 'unknown photographers' are. EIN: What do you think is the most interesting section, or new discovery, that you featured in the book? KD: Peggy Elzea's material was the most fascinating I have come across as it was all originally written within hours of the events happening and before she forgot any of the details. Reading those notes for the first time was a joy. EIN: How did you discover fans who attended these concerts like Richard Hall who provided some great text and Cathi Avenell? KD: Luck and research over many years. If there was sure fire plan of how to do it they my life would be a lot easier. In recent years, buying items off the internet has opened up a whole new world on contacts. EIN: Is this how you first came across Peggy Elzea and her amazing diaries? How long did you know her for? KD: Exactly. I knew her barely a year, and even then we were on different continents so were only able to actually speak two or three times. EIN: What was she like as a character, and was she pleased her diaries would finally be appreciated by Elvis fans? KD: When I was speaking to Peggy she was happy that her diaries were going to be seen, but she said they had never originally been written for anyone else and that she hadn't been as guarded in what she wrote as she might have been - the section in 'International' about the guys and the hookers is a prime example, she named names as told to her by the security guards, but I removed those out of discretion. She was a sweet old lady when I knew her, but she said when reading her diaries she got the impression she must have been quite brazen and fearless in her younger days. 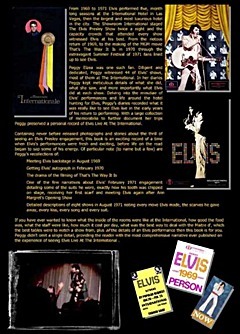 EIN: The key Elvis years 1969 and 1970 have been covered so thoroughly in previous books, was it reading Peggy Elzea’s diaries that made you think about producing your next ‘Elvis At The International’ book? KD: The only reason I was even able to do 'International' was because of Peggy's diaries. There is no other source I know of that had so many stories about all aspects of Elvis' early Vegas engagments. Yes, his shows have been reviewed many times and details of the hotel itself are known, but the truth about the food, the rooms, the infamous hookers, none of that was written down as at the time it was just part of everyday life. 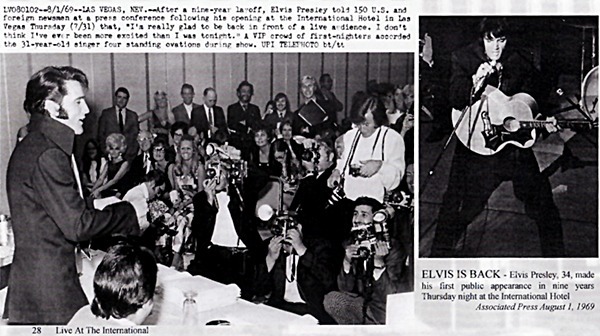 We knew Elvis attended Ann Margrets opening show in 1971 but that was all we knew. Peggy was there and wrote down what he wore, what he did, when he laughed, everything he did while he watched that show. It is facts like that which have always fascinated me. Despite the large number of books available much of Elvis' story is preserved only in broad brushstrokes, but Peggy wrote down the minutiae and that is what made her diaries so special. EIN: To be honest I was a little hesitant when I heard about your Vegas book, wondering how much more I could learn about the period – but what a stunner it is! Did you feel the same first reading Peggy’s diaries? KD: Absolutely. When I saw them I knew other concert fans would love to see them. EIN: And what a coincidence that Peggy usually arrives at the International just as RCA are setting up to record, which means fans can read her diaries about the shows while listening to the actual performances? KD: That was just pure luck on Peggy's part. But what it does do is confirm everything she says is correct and truthful. Being able to compare what she says about shows with the various CD releases that are available proves she was there and witnessed all these events. You really couldn’t wish for a better provenance. EIN: What lovely and loving descriptions she wrote especially of meeting Elvis as well as his warm kisses! What were your favourite parts of her revelations? KD: Peggy apologising to Elvis for essentially stalking him whenever she could. To be honest I loved all of Peggy's notes but I guess her meeting Elvis in 1969 (see extract below) and attending the Ann Margret show in 1971 (see EIN's review) was all new info to me.
" From the position I was in, the best I could do was reach my half bent arms up and place them on his ribcage between his arms and waist. I could feel a hard body underneath the jacket. He is so lean — he has trimmed down about as much as he can go. His rib cage felt about 18 inches across between my hands. I was sure I didn't touch him with too much pressure because at this point I just did not have any strength, but I must have startled him as he stopped kissing me and pulled back a little. (He had kissed me for five or six seconds at this point). He looked at me then he leaned in and kissed me on the mouth with his head tilted to the left. This was a briefer kiss of about two seconds, but was it just perfect! Then he gently stepped to the side and started talking to the change girl. I noticed that Elvis would turn his eyes and then his head when he looked at someone to talk to them and he would not smile unless there was something to smile about. Perhaps he was not smiling as much because he was tired after performing two shows, but he did smile warmly when he would greet someone or say goodbye. He moved slowly around us and you could tell he was getting a kick out of using different techniques for turning on his fans! Elvis said that when he starts his shows he likes to try and arouse the audience (read that as the female fans) right away. He went on to say that the female fans would storm the stage messing up the hairdos of other women and causing them to spill their drinks. Some of them had complained and Elvis had received a letter from the hotel asking him to tone down his performance until nearer the end. After he had finished talking to the change girl, three more fans arrived. The first of the girls was wearing a blue dress. She was kind of heavy but had an extremely large bust, something like 45-32-40. Elvis, who moved slowly around us, did a quick double take at those breasts. When he spoke to her he said (in his best Humphrey Bogart style), "Where did you get those big blue eyes from, sweetheart?" I missed some of the conversation at this point because Joe Esposito came in to the room. He saw me and said, "So you got in anyway?" Elvis now had his back to me and Joe was standing between us so I tried to move around him to the right, but Joe moved in front of me. Then I tried to move to the left and Joe started to move that way too but the change girl was there, so he just walked back into the dressing room. ... He had three rings on his left hand – a gold round one on his little finger, a gold square one and his wedding band. There was a cut about the size of a fingernail on his third finger and a bruise on his wrist. His black hair is fairly thick. There was one beautiful curl of hair on the nape of his neck. I studied his pants some more as they were tight enough to nicely reveal the shape of his hips. Yet the most unusual thing was his voice. I was so used to the electronic voice but the fact is his natural voice is a little different, I think a little clearer and less muffled. ... Someone asked Elvis why he laughed so much during the show. He said, "Man, that show was really crazy tonight. There I was laughing all the time." I interrupted, "Tom Jones must have cried when he was at your show last night." Elvis turned around and said to me, "No. Tom is all right. He's a good friend of mine." As I mentioned earlier, the joke completely bombed and I felt so embarrassed. The awkwardness was broken when someone asked Elvis how long, it had been since he had been out of the building. Elvis said, "I haven't been out of the building for three weeks. I'm not kidding you. Seriously, I haven't been out for three weeks." EIN: What do you think of the Variety review for August 1971 where they describe Elvis as overweight and uninspired? I find that quite amazing, where on earth did it come from? Do you think the reviewer had a bad day or Emilio gave him a bad seat? KD: Well, everyone is entitled to an opinion but compared to only a year earlier Elvis' performances were down a notch. Still very good, but not as overpoweringly energetic as before. If the reviewer had seen Elvis in 1969 then not gone back until August 1971 then the difference would certainly have been noticable. Overweight? Maybe a little more than had previously been seen but nothing to write home about. Uninspired? When listening to audience recordings of the engagement he does sound bored at times, but again nothing like in later years. So, the review was undoubtedly a little harsh but it could be argued some points rang true and were a sign of things to come. Personally I love the engagement and if you have any doubts about Elvis' commitment or appearance just fast forward to November 1971 and that spectacular tour. It didn't get any better than that! EIN: Did anyone from FTD contact you about using extracts from your book for use in the new ‘On Stage’ release? That would have been an excellent bonus for FTD buyers? KD: No they didn't. It would have been nice as it would have allowed more people to read what Peggy had to say. EIN: Did you get a copy of the "Elvis Rebooked" box-set? Again your book features 23 fabulous pages on this season and matched the box-set release. KD: I sure did. Combine this with the upcoming FTD 'On Stage' release and I think every show Peggy attended in February 1970 is available. Listen to the CDs and read the book if you want to really immerse yourself in that special second engagement - that's what I did when I was writing, but at that time there was much less material to enjoy. 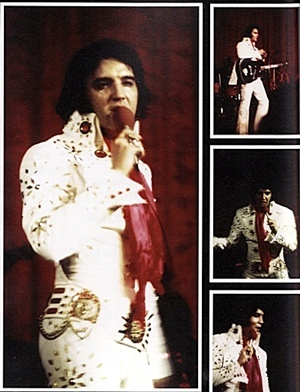 EIN: Understandably fans would have liked a few more Elvis on stage photos in the book to match the very detailed description of the concerts. An Elvis photo to reference every single concert would have been a real treat! Did you consider doing this? Were there copyright issues? KD: Vegas photos are hard to come by and most available shots are professionally taken by photo agencies and that can mean some steep reprint fees. I used the few originals I had available, but to be honest, though, I never considered putting in many photos of Elvis as that was not what the ‘International’ book was about. Yes, it was about Elvis as the International, but it was more about one fan's journey there year after year. Peggy couldn't take photos and so had only here diaries, tapes and memorabilia to go on and that was part of what I was wanting to convey. I think that despite the lack of photos of Elvis the other images used in the book still really help the reader imagine what life was like at the International. EIN: The book is dedicated to Peggy Elzea who sadly died before the book was finished. Was she in poor health and did she ever get to see what you were producing from her diaries? KD: I knew she sold her collection to pay medical bills but no-one was expecting her to die so suddenly. She died very early on in the project so she didn't even get to see a rough draft. It was sad, but I think she would have liked it. 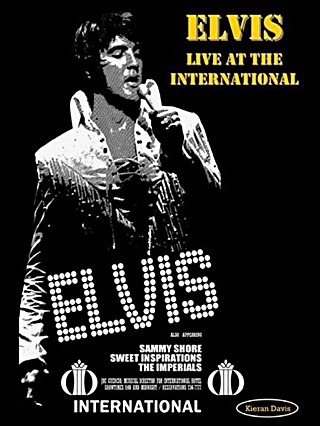 EIN: ‘Elvis At The International’ sold out very quickly once fans read the reviews, are there any copies left? KD: Yes, fans can still buy it from my website and a couple of dealers have some copies remaining, but there aren’t that many. EIN: Any copies of your Elvis November Tour 1971 book left? KD: Yes, buy not many at all so I'd buy one sooner rather than later! EIN: What’s next for Kieran Davis? Do you have another Elvis book in the works? KD: As I mentioned earlier I intended to cover every tour show and Vegas engagement in one form or another. My next book will actually cover the 1970 tours, including Houston. Again I know this is a case of coincidental timing as Erik Lorentzen’s latest book covers 1969 and 1970. I am sure there will be considerable duplication in concert photographs (it is unavoidable because far fewer are available from that time period so our sources will be the same) but I still think there is room in the market for both books. I have photographs that are unique to my book, but I also have a large number of unpublished, first hand accounts about the shows and the tours, much like my November 1971 book, including another fantastic Peggy review and a 10,000 word narrative from a fan that saw all of Elvis’ November California shows. Even a few of the stories I got from Charlie Hodge that survived my culling are included. My book won't be out until several weeks after Erik’s, but I think fans will like both and keeping the release dates apart gives both a fair shot. Erik's book will no doubt be a wonderful pictorial record, whereas mine, like before, will be much more narrative based. Hopefully they will compliment each other. It will be my longest book yet (probably about 250 pages, which is 80 pages longer than ‘International’), but I am hoping to keep the price the same as for ‘International,’ which should make it good value for money despite the publication of any familiar photographs. I haven’t thought too far beyond my 1970 book as I have been really enjoying the writing and research of those early shows. Hopefully another book will follow before the end of the year. EIN: Thanks so much for some very interesting answers - and we sure look forward to your next book. Please contact Kieran Davis via his website ASAP if you want to purchase a copy of either book. There are very few left.. Go here to Kieran Davis' website. Go here for other relevant EIN reviews and articles.